We haven’t seen the deeds of this house, which is obviously very old and built in the centre of the High Street in Thornbury near the old Market Place. At various times during its history it has been occupied as a single property, at other times shared by two businesses (or more if you include the use of the offices upstairs). Our earliest factual source for the property is the 1840 Tithe Survey which listed the property was Plot 63, a house and garden owned by John Hendy and occupied by Amelia Hendy and Francis Gillman. The Hendys – we suspect that the John Hendy referred to in the Tithe Survey was born on 21st June 1792 and baptised on 25th July 1792, the son of Thomas and Amelia Hendy. On 6th February 1792 Thomas Hendy married Amelia Cullimore in Thornbury. Thomas was born in 1770, the son of Thomas Hendy, a butcher and his wife, Mary Amelia Cullimore was born on 13th April 1771 and christened on 21st June 1771. She was the 9th child and 6th daughter of John Cullimore , a yeoman who lived at The Parks and his wife, Mary. We suspect that the Hendys were living in 18 High Street from at least 1770 based on the sequence of names given in a listing of occupiers for the purposes of assessing poor relief. We think that Thomas Hendy Senior lived here, or at least owned the property. Thomas Snr died aged 86 and was buried on 16th August 1821. In his will he left a ‘messuage or tenement wherein Thomas Hendy and John Barton the younger do now dwell with the shop, outhouses …. in the town of Thornbury on the west side of the Fore Street’. We suspect that this referred to the home of Thomas Snr as following his death in 1821, the land tax records show it was owned by Thomas Hendy (presumably now Jnr) but let out to tenants. Thomas Jr died aged 58 and was buried in Rockhampton on 11th April 1828. The land tax records show the property was transferred to the ownership of Thomas’s son, John Hendy. John appears to have moved to Blakeney. On 6th December 1810 he married Anne White in Awre with Blakeney. There is a newspaper report in the Bristol Mercury in 1826 which shows John became bankrupt. He was described as a shopkeeper, dealer and chapman at that time. They had at least two sons, Thomas was christened at Blakeney on 15th May 1813 and John christened there on 26th March 1815 and one daughter, Mary Grove christened there on 19th September 1824. It is possible that they moved to North Nibley because a Hannah Cullimore Hendy was christened there on 18th May 1828, whose parents were John and Anne. Another daughter, Anne Elizabeth was baptised on 17th November 1832 at Thornbury. At that time John and Anne’s address was at Morton and John was described as a yeoman. The 1840 Tithe Survey shows Amelia Hendy still living at 18 High Street. At the time of the 1841 census, the part of the house occupied by Amelia was vacant, Amelia was at Swan Yard, Bishopsgate in London living with her son, John and other members of the family. Amelia was shown as an ‘Independent aged 70’. John was a messenger aged 49 and his wife, Ann was aged 53. Others living there included John’s son, John a clerk aged 25, and married daughter, Amelia Bendall, a dressmaker aged 24, her husband, James Bendall a tailor aged 22, their daughter, Helen Bendall aged 2 months and some other children of John and Anne’s Mary aged 15, Hannah aged 13 and Ann aged 9. Amelia’s death was registered in Thornbury in 1847. She died aged 76 and was buried in Rockhampton on 23rd December 1847. We don’t know where John and the rest of his family were in the 1851 census. They were living in Circus Street, Marylebone in the 1861 census. John was described as a landed proprietor aged 68. We think Mary may have died in Marylebone in 1862. John continued to own 18 High Street up to his death. He died in Marylebone in 1871 aged 78. On 24th October 1877 the property was put up for sale. 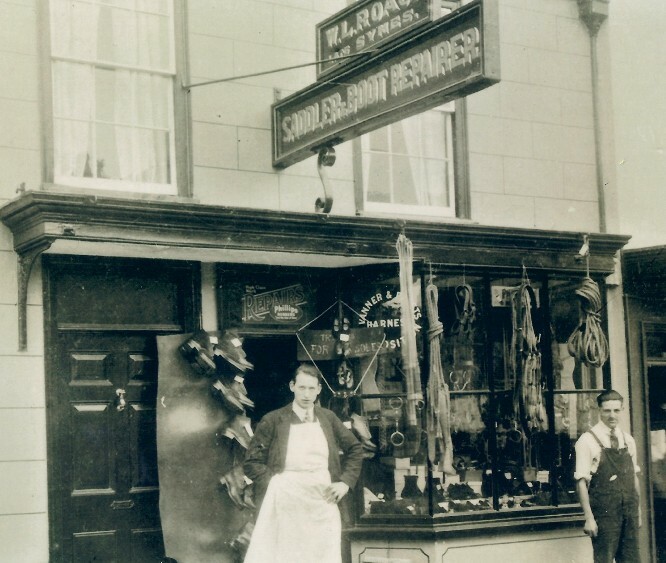 It was described as ‘a freehold dwelling house in the High Street, well situated near the Town Hall and with a large garden behind the same, now in the occupation of Mr Bones hairdresser as yearly tenant. The house contains on the ground floor, a good shop and three sitting rooms, besides kitchen, back kitchen and other convenient offices, and a large paved court; and on the first floor five good bedrooms. The garden is pleasant and productive, abounded in walled fruit’. An indenture dated 21st December 1877 shows John’s descendents and their spouses sold the property to Thomas Morgan (see below). They were listed as: John Hendy, Amelia Bendall, James and Mary Grove Ellis, Thomas Edward and Ann Elizabeth Harding and Edward and Edith Amelia Small. James Roberts – the 1851 census shows the head of the household was Mary Roberts (described as wife of James Roberts). Mary was a bootmaker employing 8 men and born in Bitton. Living with her were her children: Daniel aged 15, Ellen aged 13, Clementina aged 8, Walter aged 2 and a bootmaker Samuel Tippett aged 23 from Hanham and John Monks, another bootmaker aged 30 from Bitton. Mary’s husband, James, was not at home. James Roberts was born in Hanham and christened on 16th September 1810. His parents were James Roberts and Clementina (nee Frankoom). We don’t exactly know when James and Mary married. The 1841 census shows that they were living in Hanham with their two children: Daniel aged 6 and Ellen aged 3. John had become a shoemaker. The Thornbury trade directories from 1849 to 1856 show James as a boot and shoe maker in the High Street. We note that a Caroline Fry was sentenced to two months hard labour for stealing a pair of boots from James Roberts in January 1855. Around 1857 it appears that James may have had problems. An advert published on 4th April 1857 shows there was a sale of ‘the estate of James Roberts boot and shoemaker of Thornbury’ and the items listed for sale were all stock of boot selling trade and household furniture. The Slaters Directory of 1858/58 indicates that James may have been forced to change his line of business. He was listed as ‘Proprietor of Reading Room’. The 1859 Rate Book shows that James is still occupying the same property at 18 High Street. The 1861 census which refers to the property as ‘Literary Institution’. We suspect that this refers to “Thornbury Institution for the Diffusion of Useful Knowledge” which according to The Thornbury Journal of February 1870 met in the Reading Room in the High Street on Tuesday evenings. This organisation was founded in London in 1828 with the objective of publishing information to people who were unable to obtain formal teaching or those who preferred self education. We are slightly puzzled by the 1861 census. In spite of the fact that James apparently sold off boot selling trade in 1857 and the references to him being associated with the Reading Room, the census describes James as a boot manufacturer employing 5 men and 2 boys. He was aged 50 living with his wife, Mary aged 51, and their children: Daniel a bootmaker aged 25, Clementina aged 17, Walter aged 11 and Laura aged 6. All the family were born in Hanham, except Walter and Laura who were born in Thornbury. They also had two young apprentices living in the house. The 1862 Rate Book also lists James as being the occupant of the property. We note that there was a burial of Mary Roberts in the Congregational Church on 16th August 1863. After that there is no record of the family in Thornbury and we don’t know what happened to them. By 1867 Rate Book the property was occupied by a person called ‘Ball’. John Ball – the 1871 census shows John Ball was living in the property owned by John Hendy. The 1871 census shows he was a hairdresser aged 27 from Chipping Sodbury living with his wife Jane aged 26 from Bristol and their son, Frederick aged 2 born in Thornbury. John’s full name was John Joseph Alden Ball. He was born in Chipping Sodbury in 1844, the son of William Ball, a hairdresser and his wife, Martha who lived in the High Street of Chipping Sodbury. By the 1861 census John had become a blacksmith, but this career didn’t last long. By 1871 he had become a hairdresser like his father. John had married Jane England in Bristol in 1867 and the 1867 Rate Book indicates that he came straight to live in Thornbury. By the 1876 Rate Book the Balls had disappeared from Thornbury, presumably to return to Chipping Sodbury High Street which is where they were in the 1881 census. By that time they had had several more children: Stanley Alden born in 1872 in Thornbury, Blanche aged 5, Albert aged 3 and Henry aged 1 all born in Chipping Sodbury. There was another daughter listed, Alice born in London aged 16. John died in Chipping Sodbury in 1905. His probate record shows that he died on 17th July 1905 and probate was granted to Stanley Alden Ball, a livery stable keeper. Henry Christopher Bones – the 1876 Rate Book shows the property occupied by Henry Bones but still owned by the representatives of the late John Hendy. Henry Christopher was born in Clifton and baptised on 13th October 1850. He was the son of Charles Bones, a hairdresser from Bath and his wife Emma. In the 1861 census the family were living at Clifton. The 1871 census shows Henry had moved to Thornbury where he was a hairdresser and perfumer at 3 High Street. He was unmarried at the time, but later in the year Henry married Jane Barnes at Clifton. Their first son William Christopher was born in 1873 and his birth was registered in Thornbury. On 16th April 1875 they had a second son, Arthur Henry baptised in St Mary’s Church Thornbury. The 1877 Trade Directory lists Henry as a hairdresser and china and earthenware dealer in the High Street. The report of his son William’s marriage says that Henry was called “Barber Bones” in Thornbury. We understand that the family migrated to Melbourne in 1879. In 1909 Henry and Jane brought their daughter Lily home to England on the SS Marathon, presumably for a visit. We know a little about how the family earned their money and where they lived in Melbourne from a case in the Melbourne newspaper called the Argus of 3rd April 1915. Henry Christopher Bones was described as a licensee of the London and Caernarvon Hotel in Flinders Street, Melbourne. Henry and his son Frederick were charged under the War Precautions Act and told they could have been made to appear before a courts martial. Henry had heard his customers discussing the sinking of a large vessel called the Medic by torpedo and Henry had told his son on the telephone. Frederick had put a notice outside his pub saying that the Runic (sic) had been torpedoed. Nowadays this would be quite a commonplace thing to do and the newspaper makes it clear that it was a topic of general discussion in Henry’s pub. However this was at a time of war and Henry and his son were charged with spreading false reports to cause alarm and disaffection in time of war. This was a serious offence and although seeming committed in all innocence it was viewed gravely. The court made it clear that Henry and Frederick got off lightly with fines of £1 and £2 plus costs. In 1928 William Christopher Bones, said to be of Melbourne Australia, married Olive Irene Panes the daughter of Mr and Mrs Joseph Panes of Down’s Farm Alveston in Alveston Parish Church. The groom gave the bride a motor car as a wedding present and the couple were said to be intending to spend their honeymoon touring in Devon and Cornwall by car but they would then leave for Melbourne. William Higgins Balch – the 1867 and 1869 Rate Books shows William Balch was sharing the property at 18 High Street. The 1871 census shows the property is shared by William Balch and John Ball. William was a journeyman harness maker aged 36 from Somerset living with his wife, Elizabeth Mary aged 30 from Mere in Wiltshire. According to family trees on Ancestry website, William was born on 2nd June 1834 at South Brewham in Somerset. His parents are a bit of a mystery. By the 1851 William H. had become an apprentice saddler with Charles Dowding in Wincanton. The 1861 census shows he was a harness maker living at 5 Hampton Place, St Phillips, Bristol. His mother, Elizabeth a staymaker aged 48 from Bruton in Somerset. Also there was a visitor, Elizabeth M Curtis a dressmaker aged 21 from Mere in Wiltshire. We suspect she was to become William’s wife on 9th March 1863. The family trees on Ancestry show William emigrated to the USA. He married again on 7th April 1880 in Cuyahoga, Ohio. His second wife was Eliza Maire Lee and they had three children: Henry Lee in 1881, Frank Victor in 1883 and Ralph Macy in 1885. William died in Cuyahoga in 1889. Frank Symes – the 1890 Rate Book shows that Frank had become the owner of the property and the 1891 census shows he had set up his saddler’s shop there. In 1891 he was there living with Augusta. Frank continued trading there until about 1926. When he retired the shop was taken over by his assistant William Lawrence Roach. William Lawrence Roach – the 1926 Rate Book shows Lawrence was occupying the shop and premises. He was born in Falfield in 1903, the son of Harry Povey Roach and his wife Jane. In 1916, Lawrence had started as an apprentice saddler with Frank Symes, the previous owner of the shop. He took over the running of the shop when Frank retired in 1926. Lawrence also served as a fireman. Following Frank’s death on 21st October 1931, the house and shop on the High Street was conveyed to William Lawrence Roach, together with the stable or cart shed on the south side of Soapers Lane which Frank had bought on 24th June 1919. Lawrence married Edith Sybil Cook in Thornbury in 1928. Edith was born in the Stroud area in 1905. They had a son, Clifford Basil, born on 14th February 1929. Lawrence continued running the shop until about 1936 when he and the family appeared to move to Somerset. On 30th December 1936 Lawrence sold the stable or cart shed in Soapers Lane to Kate Isidora Yarnold. We assume that the house and shop was sold about the same time, but it was not included on the indenture we have seen. The photo at the top of the page shows Lawrence outside his shop. Thornbury Museum was presented with two items of family memorabilia by Lawrence’s son Clifford. One was a leather driving bridle made by saddler and harness maker William Lawrence Roach. It was made for a working horse and features bells on the headpiece and carries the name ‘WL Roach of Thornbury’. The second item was Lawrence’s apprenticeship document when he was taken on by Frank Symes, also of Thornbury, in 1918. Lawrence was appointed at the age of 15 and was apprenticed for five years on a starting wage of 12 shillings a week and rising to 16 shillings. We understand that Lawrence suffered an accident and following his retirement from the Thornbury shop he went on to run a grocery shop in Shirehampton. He carried on doing a bit of harness work which is when he made the one presented to the Museum. Francis Hopkins – the property was taken over in 1937 by Francis Hopkins. He set up a grocery shop there. He had been running a mobile grocery business since 1933, using an old second hand Fiat car from his home in Crossways.